Sainte-Agathe-des-Monts, Que., September 13, 2015 – Joël Levac and Stéphanie Lewis of Montreal marked a new high point in their rally career by winning the Rallye Défi, their first-ever victory at a round of the Canadian Rally Championship. Driving a former World Rally Championship MINI, the pair attacked on the first day of the rally, and then slowed on day two when rain contributed to slippery conditions. During the first day of competition, the team were able to match the times of the eight-time Rallye Défi winner Antoine L’Estage (St-Jean-sur-Richelieu, Que) and Alan Ockwell (Toronto), of Subaru Rally Team Canada. When conditions became challenging in the rain, L’Estage and Ockwell pressed hard to build a lead until fuel problems forced the team to retire, handing the lead over to Levac and Lewis. 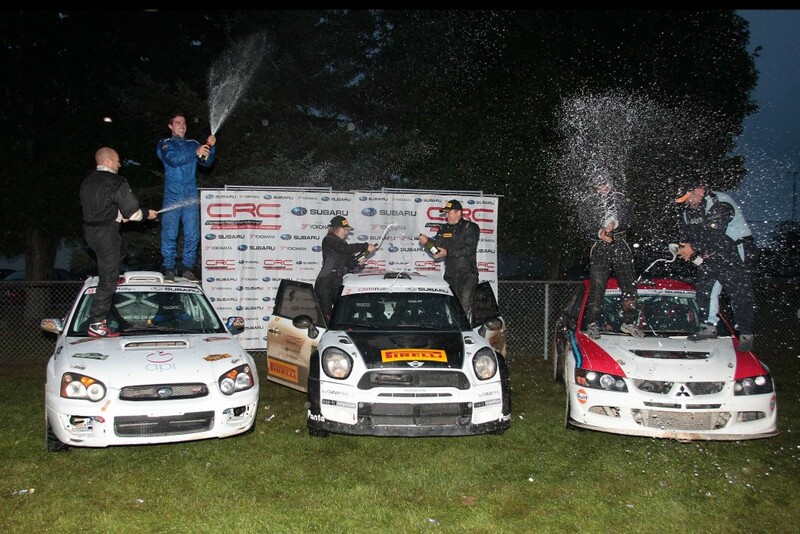 Karel Carré (Laval, Que) and co-driver Philippe Poirier (Quebec, Que) drove a spectacular event to finish second after a challenging battle with season-long regional rivals Jean-Sebastien Besner (Montreal,Que) and Yvan Joyal (Terrebonne, Que). Carré is only in his second year of rallying and Rallye Défi marks his second national level event. The second place finish marks a career-high finish for this talented young driver. Besner and Joyal struggled with minor car problems through the event, and despite the pair’s best efforts, they slipped back to third place overall. Besner last finished on the Rallye Défi podium when he won the event in 2001. The team of Nicolas Laverdiére (Laval, Que) and Jean-Mathieu Tremblay (Montreal, Que) were consistent in their two-wheel drive Honda, to finish in eighth place. Although the team faced suspension problems on the rough roads used to open the event, they were able to make repairs without having lost a lot of time. The 2014 Canadian Two-Wheel-Drive champion Simon Dubé (Jonquière, Que) and stand-in co-driver Aaron Crescenti (Glen Gardner, NJ) were leading two-wheel drive until mechanical problems halted their rally on day two. A restart rule allowed the team to continue after making repairs, but incurred heavy penalties forced the team down to tenth place. The Rallye Défi marks the start of the fall rally season in Canada. Held on roads that snake through the scenic Laurentian mountains surrounding Sainte-Agathe-des-Monts, the event takes place over two days and consists of more than 175kms of competitive sections. As often happens, conditions for the first day were hot and sunny with dust trails kicked up behind each rally car. Overnight, a storm system moved in and rain turned the gravel roads into slick surfaces that caught out many experienced teams. Rally car racing is often described simply as “real cars, real roads, real fast.” The all-season motorsport sees drivers and their co-drivers take modified road cars to the limit as they achieve blistering speeds over closed-road courses that typically cover more than 150 kilometers of gravel, dirt or snow-covered roads. Fans can get up close to the cars in the service areas and catch all the action from designated spectator points located at the best spots on the route.